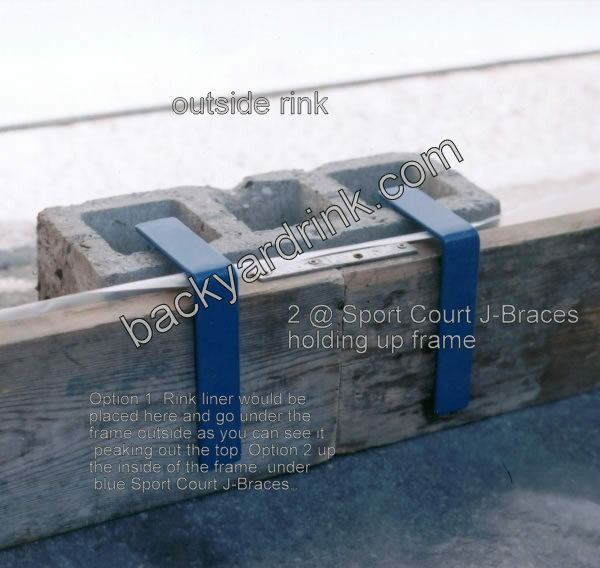 The Sport Court Ice Rink J-Brace was developed for a vertical hold on your 2″ x 10″ frame to a support structure like a cinder block. Cinder blocks have weight and grit and resist movement on sport court surfaces. 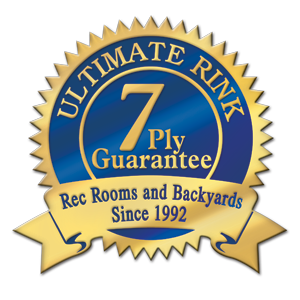 Also perfect for “In Line” roller blade sites as the premise is identical to that of a sport court set up. Now available in 6 packs with 2 in red and 4 in blue for red line blue line bonus. 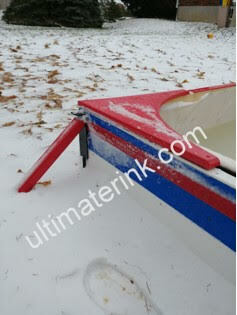 Another multi functional Ultimate Rink product. Not exactly as shown. New image coming soon. The Sport Court Ice Rink J-Brace is the ticket for SPORT COURT and PATIO or IN LINE SURFACES of stone and brick too! They are used in conjunction with cinder blocks to hold your framing upright. 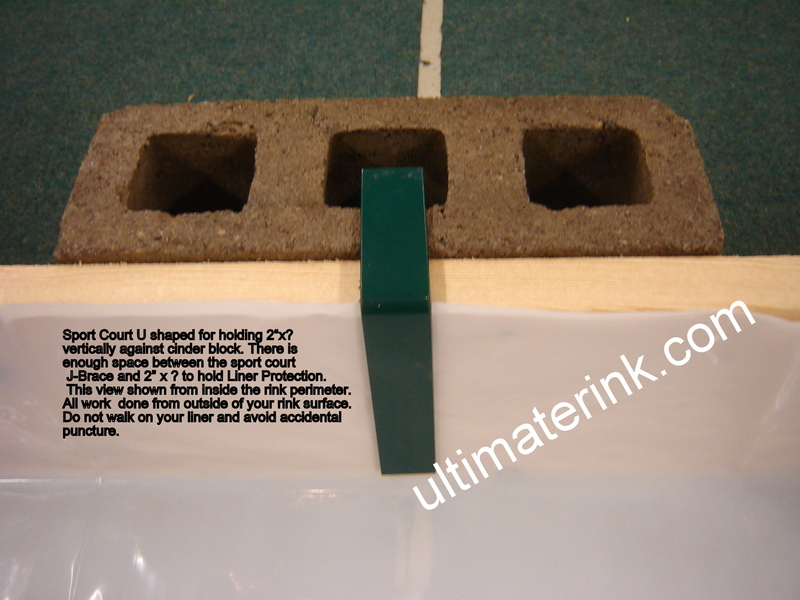 The cinder block would sit flat on your cement, pavement, patio stone or sport court surface. The caveat to this is it’s ability to hold up to 3″ of water. 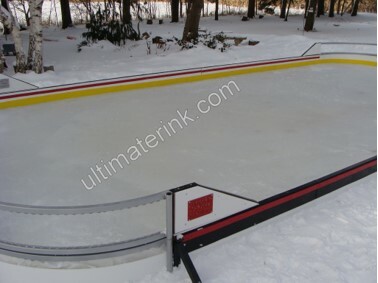 Where your water will be deepest you will require placement of this special steel Sport Court Ice Rink J-Brace more often. Most sport courts have minimal slope but keep in mind that a minimal slope of 1% results in a 6″ water depth over 50′ in width or length. 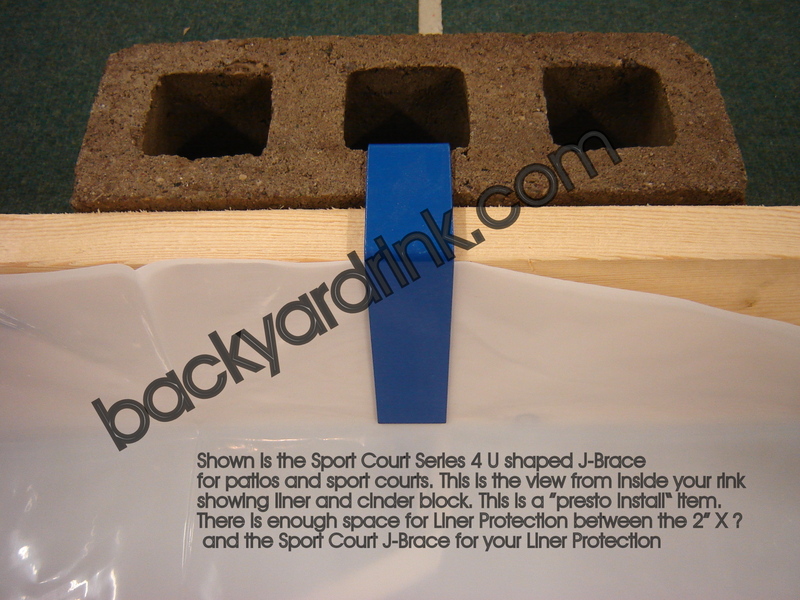 These Sport Court Ice Rink J-Brace Series are designed to be used in that one area where your rink reaches into your patio, driveway area or around your entire sport court. Gap 3.25″ and can be pinched to adapt to various cinder block sizing. 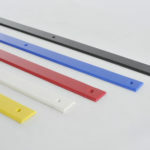 Powder coated steel for longevity and now available in red and blue for your red line and blue lines. 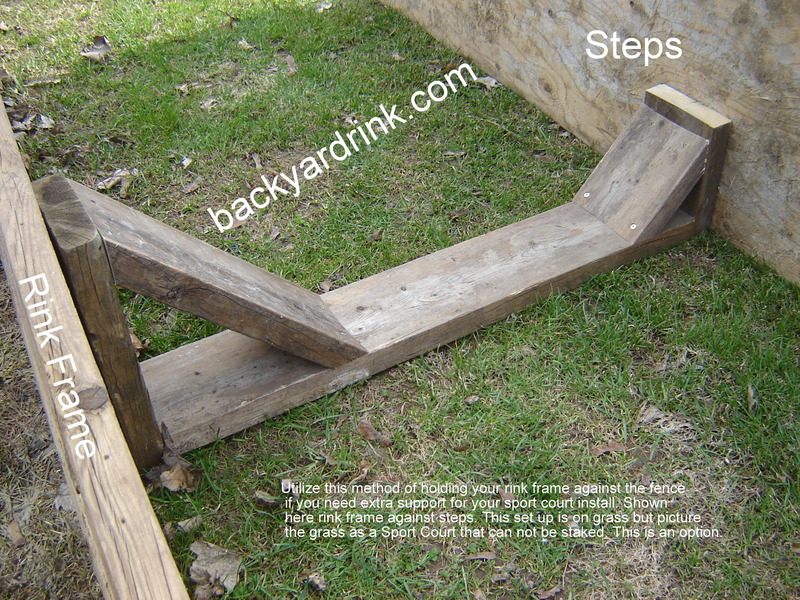 Planning Tips: You would increase your success with a sport court or patio assembly with the following. 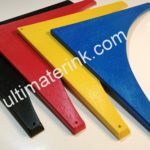 Always use our regular Ultimate Rink 5 in 1 Rink Stakes in your areas where you need the most support. 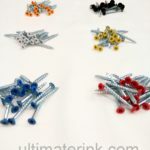 This would occur in the deepest area that allow you to use grass/soil for staking the 5 in 1. Pound them into the ground at the edge of your sport court or your patio edge and if you have a projected water depth of 5″ or more. 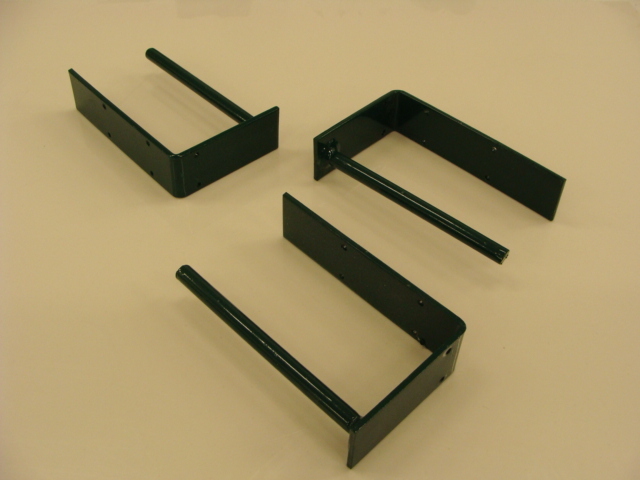 Support 45’s would be used with your 5 in 1 Rink Stake for extra frame support in your traditional method if your water depth approaches 7-10″ or more. 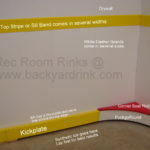 Visit the Video Page and view 5 Way Rink Stake, Shockingly Simple if in doubt as to the assembly process. 2. The balance of your other areas not consumed by an over abundance of water can now be supported by the aforementioned Sport Court Ice Rink J-Brace and cinder block set up.